How to delete your OnePageCRM account? We are sorry to see you go but nonetheless thank you for giving us a try! Please note that when you delete your account, your data will be permanently deleted. If you sign in again with the same email address, the system will treat you as a new user. If you are not 100% sure that you want to delete your account, please email us before deleting. 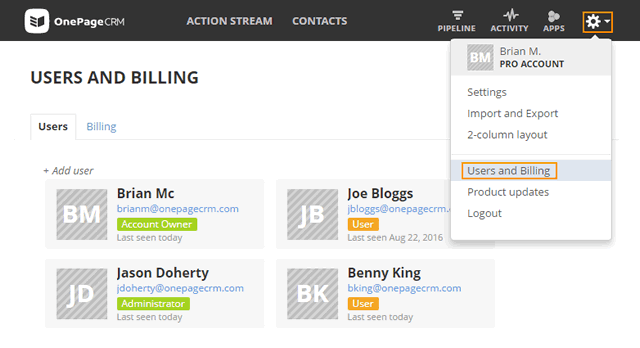 Before you can delete your account, you must first cancel your OnePageCRM subscription. 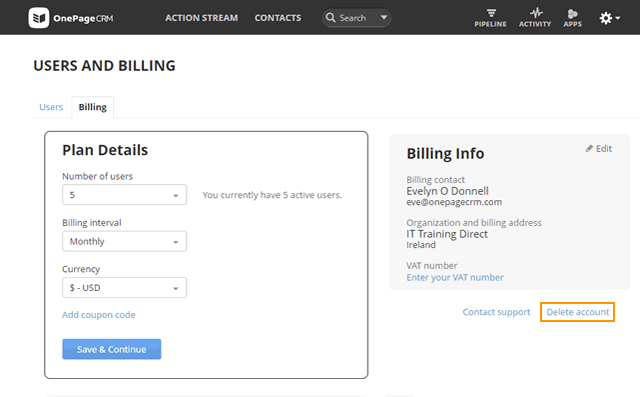 Go to Gear icon → Users and Billing. Under Billing, click on the Delete account link just below the Billing Info section. In the Delete Account pop-up, enter your password and click on the Delete Account button. What happens after deleting my OnePageCRM account? After deleting your account, you will no longer have access to your data. However, upon the account owners request we can restore your account for up to 14 days after initial deletion. After 14 days, we cannot restore your account.